It goes without saying that the bedroom and the washroom are the two most commonly used rooms in a house and if anything happens to them then the routine life at home is significantly disrupted. gotten your bedroom or washroom locked then there’s only one emergency locksmith to call and that is the most reputable 24-hour locksmith in Toronto, A1Locksmith. At our company, we pride ourselves on being the number one locksmiths in all of Canada. 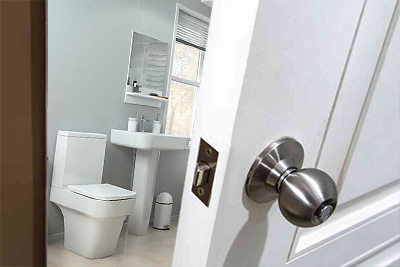 We are a reliable locksmith in Toronto who are equipped with all the right experience and expertise that is needed to Unlock Washroom/ bedroom. We guarantee to lessen your inconveniences as much as possible. You can call us right now at 647-557-6403 to find out everything you need to know about our business. Free estimate included!